Yamaha RX-V385 - AV receiver - 4K - HDR - 5.1 channel - blackUncompromising value. This 5.1-channel AV receiver brings the amazing technologies to your home including Dolby Vision, 4K Ultra HD, HDR10 and Bluetooth at an affordable cost. Features include built-in Bluetooth for wireless music streaming, stunning 4K Ultra HD video with HDCP 2.2 (4/1), high dynamic range (HDR), BT.2020 compatibility and a discrete 5.1-channel amplifier design with automatic YPAO calibration to ensure optimal performance. Additionally, CINEMA DSP technology supports the playback of HD audio options like Dolby TrueHD and DTS-HD Master Audio to provide you with the natural and expansive sound imaging possible in this entry-level receiver. Uncompromising value. This 5.1-channel AV receiver brings the amazing technologies to your home including Dolby Vision, 4K Ultra HD, HDR10 and Bluetooth at an affordable cost. Features include built-in Bluetooth for wireless music streaming, stunning 4K Ultra HD video with HDCP 2.2 (4/1), high dynamic range (HDR), BT.2020 compatibility and a discrete 5.1-channel amplifier design with automatic YPAO calibration to ensure optimal performance. 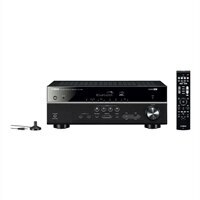 Additionally, CINEMA DSP technology supports the playback of HD audio options like Dolby TrueHD and DTS-HD Master Audio to provide you with the natural and expansive sound imaging possible in this entry-level receiver.